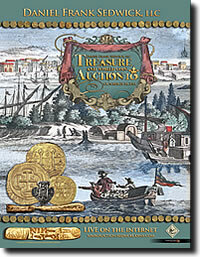 Daniel Frank Sedwick, LLC has just opened their Treasure and World Coin Auction #10 for bidding, closing live on the Internet in four sessions on October 25-26 (Tuesday-Wednesday), viewable online at www.Auction.SedwickCoins.com. The coin lots for this auction will be available for viewing at the A.N.A.’s National Money Show in Pittsburgh, PA, October 13-15, with private viewing at Sedwick’s office in Winter Park (by appointment only) before and after the show. Of the 1400+ lots in Sedwick’s latest auction, more than 240 lots are gold coins from around the world. Over 100 of these are gold cobs, most of them comprising The Santa Fe Collection of dated Bogotá cob 2 escudos, a landmark reference collection of over 50 different dates, showing changes of styles and assayers over the 130 years of their production, including several "first and finest knowns." "The Santa Fe Collection was carefully formed within the past decade with an emphasis on clearly visible dates," says firm owner Daniel Sedwick. "Misreading partial dates has created much confusion in this series, which this educational collection will serve to clear up." But the single most important gold item in the sale is a Brazilian gold monetized ingot of 1832, cast at the Serro Frio foundry under Emperor Pedro II, a very late and exceptionally rare example with its original foundry certificate (known as a guia). "Every time one of these Brazilian ingots comes up for sale it is a major numismatic event, and ours has reason to be even more so," says Sedwick’s assistant Agustín (Augi) García, emphasizing that less than 10% of the known ingots still have their original guias. 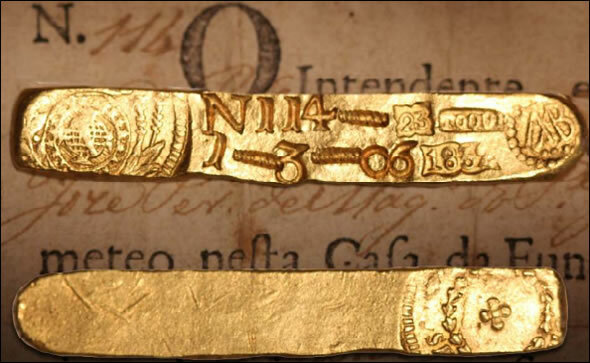 Other significant pieces of gold in the auction include: a gold bar from the "Tumbaga" wreck (ca. 1528), one of only a handful known, cast from the first spoils of New World conquest; a high-grade emerald cross from the Spanish 1715 Fleet; a filigree devotional scapular from a ca.-1800 wreck (unidentified); and the ornate gold ring embedded in debris from the Spanish 1733 Fleet that was featured on the cover of Flash of Gold, a classic treasure-huntingbook written by Marty Meylach in 1971. The auction will also feature a large number of silver ingots, including "tumbaga" (ca. 1528) bars, large Atocha (1622) bars, neatly cast Dutch bars (early 1700s), and a handful of others, all from shipwrecks. Shipwreck coins in this auction include a significant offering of dated and rare cob coins from the São José wreck of 1622 and countermarked Potosí 8 reales and 4 reales from the Capitana (1654) and Maravillas (1656) wrecks. Non-shipwreck cobs are well represented in this auction also, with more non-wreck 8 reales than have ever been offered in any of Sedwick’s previous sales, including several date-runs and big wholesale groups of chopmarked Mexican 8 reales and Panama-hoard (ca. 1629) Potosí 8 reales. There is also a significant date-run collection of Lima and Potosí cob 4 reales, as well as Hearts, Royals and a unique machine-made trial-strike Guatemala 2 reales of 1742. Ancient coins and world silver coins in this sale include Chinese ingots, some very rare early Colombian issues, important French coins, and Mint State Mexican pillar dollars, in addition to medals and tokens and banknotes. As usual, Sedwick features a wide range of artifacts, many from shipwrecks, among which are several large cannons as well as flintlock guns and cuphilt swords. Printed catalogs (288 pages, full color) will be available starting Monday, October 10. For more details go to www.sedwickcoins.com.